Two of the most important events for the Jewish people that are predicted to occur near the start of the Kingdom Age include the redemption of Israel and the restoration of the nation. At that time, Israel will finally be established in the full peace and blessing of God within the Promised Land. These two events—redemption and restoration—are inexorably linked and will finally fulfill all of the blessings promised to Abraham’s descendants from the very beginning (Gen. 12:2-3; Gen. 17:1-8; Gen. 26:4). To understand how these crucial events will come to pass and how the Jews will ultimately be redeemed, we must consider a number of key Biblical verses and prophecies about the redemption of Israel. Many of the prophecies will find complete fulfillment only at the end of this age and at the very moment of Christ’s return. An important difference between Israel today and what Israel will become in the Kingdom Age is the makeup of the people who inhabit the Jewish state. Today, the nation of Israel is a pseudo-secular state, but with a strong underlying influence from traditional Judaism. The form of Judaism today is similar to the Mosaic system followed at the time of the Pharisees, but in our day the nation does not have the full sacrificial system of worship, because the Temple is not yet rebuilt. In addition, just as the Pharisees were against the Lord in First Century Judea, the elite of Judaism today is openly against Christ. Although Israel may acknowledge the importance of the political and financial support from the worldwide Christian community, they are blatantly anti-Christ in terms of believing that Jesus is the Messiah. However, in the Kingdom Age Israel will consist exclusively of Jews who follow Christ, and all those who reject the Lord will perish before the Millennial Age begins. The reborn state of Israel in the Kingdom is also predicted to become the leading country in all the Earth, and the rebuilt Temple in Jerusalem will be the primary focal point for worship and the place where the Lord will literally sit upon His rightful throne to rule the world. Furthermore, in the previous section entitled The People of the Kingdom, it was demonstrated that there would be two types of people living throughout the Earth in the Millennial Age. These two groups will include 1) glorified, immortal Christians, which will consist of all believers who are resurrected or transformed into new incorruptible bodies at the point when Christ and his angels descend from heaven at the Seventh Trumpet and 2) normal human (mortal) people, which will be represented by all those who ultimately survive the Great Tribulation and are subsequently identified by Christ as the Sheep when He judges the world (Matt. 24:31-46). The group identified as the Sheep will consist of mortal people and will ultimately include all the descendants of the initial survivors from the Tribulation. There will thus be a vast growing offspring of these survivors, who will fill the Earth and perhaps eventually number as many as billions of people living during the 1000-year Kingdom. The way that these two groups are predicted to be assembled means that there will be a fixed number of resurrected Christians which are identified at Christ’s return (and transformed at the Seventh Trumpet) and an ever growing number of mortal people living on Earth. In this section, as we study the prophecies concerning the redemption of Israel, we will be led to a similar conclusion: that the Chosen Nation will become like the rest of the world, consisting of both resurrected and mortal people—in this case people of Jewish descent—living together with Christ in the land of Israel. Let’s now look at the Biblical predictions that teach about the redemption of Israel, and in particular how these two groups of resurrected and mortal Jews will come to make up the reborn Jewish nation in those days. In the sections that discuss the End Times prophecies concerning Israel, it is shown that the Jewish people will obtain their promised time of blessing only after they repent and the Lord returns to save them. In fact, according to these prophecies, a significant part of Israel will finally believe and receive their true Messiah, Jesus (or Yeshua to the Jews), just in time to be rescued and delivered from the attacking armies at Armageddon. Thus, in Israel’s darkest hour when everything appears lost and the entire world is suffering and close to dying from a vast nuclear holocaust, a significant part of the surviving Jews will turn back to God and be saved by the very Messiah they had previously rejected. However, the complete story of the redemption of Israel is much more complex than a last minute rescue at the end of the age would lead us to believe. This is because the Jews have been the Chosen Nation as appointed by God for a considerable amount of time—in fact, for nearly four thousand years. It turns out that the redemption of Israel has in some way depended upon when an individual Jew may have lived during this long history—particularly, whether they may have lived before or after the First Coming of Christ or before or after the Second Coming of Christ (more particularly, at the point of the Seventh Trumpet). In the beginning, before Christ came to the Earth, the Jews obtained salvation by repentance and faith in the one true God, Yahweh. Even from the time that Abraham was said to have “believed God, and it was counted to him for righteousness” (Romans 4:3), the Jewish people were admonished and taught to repent from sins and put their trust in Yahweh as the path to salvation. Anyone at that time—even non-Jews—who turned to God and put their faith and trust in Him, would have their sins forgiven, and the Lord would count that faith as righteousness. The reason this forgiveness was possible even before Jesus sacrificed himself was that God had foreseen Christ’s work on the cross from the very beginning of creation. On the day that Christ was crucified, he took all of the sins of the world upon himself—even those sins that occurred before his time combined with those sins that would occur after his time—and he suffered and died in our place so that God could forgive us. One sacrifice for sin for all time! “For God so loved the world, that he gave his only begotten Son, that whosoever believeth in him should not perish, but have everlasting life”. The Book of Revelation says that Jesus is “the Lamb, slain from the foundation of the world” (Rev. 13:8). Peter also says that Christ “was foreordained before the foundation of the world, but was manifest in these last times for you” (1 Peter 1:20). Incredibly, these verses mean that God planned everything even before he began creating the universe! He anticipated the fall of man and the need for a Savior. He foreknew and planned that the Son of God would be born into the world and would have to be sacrificed for sin. In this way, every Jewish believer before or after the first coming of Christ could obtain salvation through a simple act of faith in the Lord. Therefore, at the Seventh Trumpet (Rev. 11:15-19) there will be a large group of Jewish believers from history that will be resurrected when Christ descends from Heaven, and they will all become members (along with the Gentile believers) of the immortal Bride of Christ having incorruptible new bodies as they enter the Kingdom Age. The first part of the redemption of Israel thus consists of this large group of Jews from history who lived faithful lives at any time throughout the ages. The Bible actually promises that there would be a certain number of believing Jews in every generation. The Lord says that there would always be a small portion or remnant of Israel, which would be kept by God throughout history as true believers. This fact held true during some of the darkest days of Israel, even when the nation turned away from God into deep idolatry and sin (1 Kings 19:18). Nevertheless, God still brought a remnant of believers out of the darkest of times to be saved by faith. This fact was also true at the time of the Apostles. Though the nation itself rejected Christ, a small group of Jews became believers in Jesus. At that time, the Disciples and their followers became the new faithful—those that believed in the Lord and became the first of a new order, the Christians or those who follow Christ. This aspect of a continuing remnant also remained in place even when Israel was scattered in judgment among the nations for nearly 2000 years after the destruction of the Temple in 70 AD. Therefore, the remnant at any point in history since Christ’s first coming consists of that small segment of Jewish people, like the Apostles and their early followers, who believe in the Lord as their Messiah even in the face of spiritual blindness and opposition from the majority of Jews. Today, as in previous times, the remnant represents that fraction of Israel in the world who are not merely Jewish by descent (after the flesh), but are Jewish Christians (after the Spirit) and thus true followers of the Messiah, Yeshua (Romans 2:29; Romans 8:1). Therefore, the first fruits of Israel to enter the Kingdom of Heaven will be all those Jewish believers who were a part of the remnant throughout history right up until the Second Coming of Christ at the moment that the Seventh Trumpet sounds. This group will be exactly like the group of Gentile believers who have followed Christ through the ages. Both groups of believers are one, and they will hear the tremendous sound of the Trumpet and in an instant be raised from the dead or, if they are still alive, they will be instantly transformed into incorruptible and immortal bodies to be evermore with the Lord (see The Return of Christ). In addition to the believing remnant that has been kept by God throughout the centuries, there is also a considerable number of Jews that are predicted to become believers in Christ during the last seven years of this age. These Jews are predicted to be saved “as through fire” by the ministry and warnings of the two witnesses (Rev. 11:3-13) and also through the work of the 144,000 (Rev. 7:1-8) as well as through the testimony of all Gentile Christians (Matt. 24:14; Rev. 7:9). The undeniable fulfillment of Biblical prophecy during the last seven years combined with the most perilous conditions ever experienced on Earth will lead many to Escape to Safety in Jesus. The Lord says in Hosea that at the time of the end he will give Israel “the valley of Achor for a door of hope” (Hosea 2:15). Achor means trouble. It will be the terrifying trouble of the Last Days and the worldwide cataclysm of the Great Tribulation when all nations turn against Israel that will cause many Jews to lose hope in the world and begin to believe in Christ. They will see first hand the fulfillment of many prophecies and they will quickly realize that there is no other hope for salvation but in the coming of the true Messiah. Just as the believing remnant throughout the centuries, the Jews who turn to Christ during the last 7 years will be resurrected or transformed at the Seventh Trumpet along with the believing Gentiles from all ages. The totality of all these Jewish Christians will become part of the immortal and incorruptible followers of Christ living in Israel during the Kingdom Age. However, the story of the redemption of Israel is not quite complete from just considering the believing remnant. There is one final group of Jews that is predicted to be rescued at the last possible moment of the Great Tribulation. These Jews will be saved by the skin of their teeth. Their salvation will occur just after Christ returns to save Israel, which also correlates to the point when all the armies of Armageddon begin to fill the land for the final battle of death. This last group of Jews is predicted to become believers only after witnessing the Return of Christ, after hearing the sound of the Seventh Trumpet, after seeing the fantastic event of the resurrection, and after seeing the amazing and very visible gathering of all believers by the angels unto the Lord. And if seeing all those events were not enough, when the Lord powerfully returns to the Earth at the Mount of Olives, splitting it in two with a massive earthquake, even these last doubting Jews will finally understand that He is their only hope for safety and salvation. “For I will gather all nations against Jerusalem to battle; and the city shall be taken, and the houses rifled, and the women ravished; and half of the city shall go forth into captivity, and the residue of the people shall not be cut off from the city. When the Battle of Armageddon occurs, the nations will attack Israel and Jerusalem, and it is predicted that half the city will be taken. [It is interesting that in our generation there is a contentious division of Jerusalem into two halves: East and West Jerusalem!] 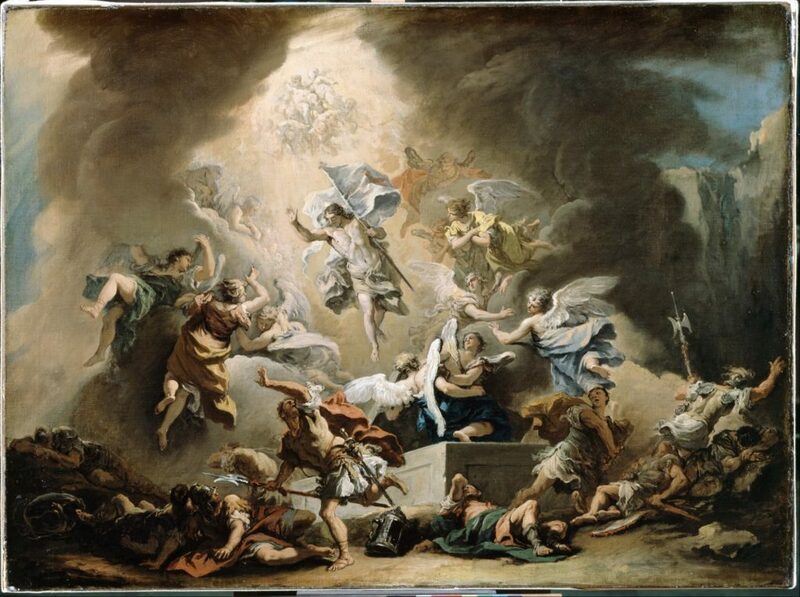 At the point of the final battles when everything appears to be hopeless—when much of the entire world has been decimated by war and Israel is threatened by hundreds of millions attacking fighters—the Lord will suddenly descend from Heaven to the Mount of Olives. Zechariah says that the power of His coming to the Earth will be so great that an earthquake will occur and cause the mount to fracture and separate to the north and to the south, leaving a huge chasm and valley running east and west through Jerusalem. The prophecy says that all believing Jews left in and around the city will flee into this valley and will be protected. This new valley will be a place of safety while the Lord goes forth to fight against the massive armies that have assembled within Israel. These armies will have captured half the city of Jerusalem and they will be occupying territory throughout the Judean mountains. However, the largest concentration of armies is predicted to actually fill the huge Valley of Jezreel to the north of the Carmel mountain range in northern Israel. This is the place the Book of Revelation calls Armageddon. Israel in the Kingdom will therefore be made up of a unique combination of resurrected and mortal people, just as will the rest of the nations that enter the Millennium (see previous section). All of these events representing the redemption of Israel will finally lead to a new day of peace and safety as Israel enters the Millennial Kingdom in fulfillment of all of the blessings promised to Abraham thousands of years ago. At that point the nation of Israel will prosper far beyond anything ever seen among the nations.